It's official: We are accepting applications from individuals aged 16+ who are ready to activate the KCTL mission: Bringing Tennis to the Kids. Tennis skills are appreciated, but not required. Most of all, we are interested in positive attitudes and a passion for inspiring and motivating children in underserved communities. Most of our volunteer opportunities are "on the ground"--on the tennis courts, blacktops, and playgrounds surrounding public housing developments in Bed-Stuy. This is a biweekly commitment from May 28 to October 1 at an assigned teaching site. To quality, current and prospective volunteers must complete one training session on April 16 or 23. Additionally, we're open to meeting volunteers who can share their skills in Fundraising, Event Planning, Grant Writing, Photography, Videography, Web Design/Development, and Public Relations. Complete our general volunteer signup form. Register for one of two mandatory training sessions in April. For three seasons, Lafayette Gardens Volunteer Efi da Silva has been a valuable role model to KCTL kids. Today, Efi shares her thoughts on teaching children and her observations of "growth on all fronts" program-wide. Unlike our past #IServeBecause interviewees, Efi did not come to KCTL as a tennis player. Her lack of experience with the sport, though, did not undermine her impact as a volunteer, but enriched it as she learned something new alongside the students. How and when did you learn about KCTL? I heard about KCTL through my old roommate. (Hi, Tiffany!) She had volunteered the previous year and convinced me that I didn't need tennis experience to participate. When I was younger I participated in free programming that helped me gain exposure to areas that I otherwise would not have had an opportunity to partake in. After learning about KCTL and the opportunity it provides to kids in Bed-Stuy, it made sense that I become a volunteer. What, if any, prior experience did you have with tennis and/or with children? I had taught kids before, but since I had no tennis background, my first year I learned alongside the kids and guided them as I picked things up. What can you identify as the most significant positive change(s) to KCTL since you began volunteering? Since I started volunteering two years ago, the most positive change has been growth on all fronts: the number of kids, the number of volunteers, the number of sites. But then there's also the refined and amplified curriculum. You can see the kids improving in tennis and learning skills on the court that they can take with them to school, home, or wherever they may find themselves. As we near the end of the season, what's the most important lesson you want the LG students to take away from the program this year? LG kids are awesome and I see this seed in them already, but I'd like them to remember to not let wins and losses on and off court define or discourage them but instead to keep persistent at whatever goal they're working towards. Volunteer Deborah Kalloo has enjoyed an inspirational first summer with Kings County Tennis League. As a teacher and recreational tennis player outside of the Sumner Tennis Club court, she's grateful to have found an opportunity that combines her passions. Deborah enlightens us with her personal account of being a role model for children through the sport of tennis. How did you learn about KCTL? I was having coffee in a cafe on Fulton Street, where one of your flyers caught my eye. I registered almost immediately thereafter, completed group training with Meredith, and here I am today. What motivated you to join our program? My motivation primarily came from my love of tennis. I was excited by the opportunity to teach tennis, learn about teaching tennis, and to meet people to who also love tennis. Can you tell us about your prior tennis experience? I played team tennis in high school, and I was fortunate enough pretty impressive and positive seniors as my coaches and role models. When I came to New York, I took a few lessons at Prospect Park Tennis Center to brush up on my skills. I've since upgraded by approach to tennis. How has your experience working with kids as a teacher informed your role as a volunteer at Sumner? As a high school Math and Computer Science teacher, I utilize some of the same strategies with the students at Sumner. Specifically, I incorporate the listening and rewards strategies I've developed in the classroom. I also believe that as a teacher it is important to impart values for my students, so I was happy to see that KCTL integrates this aspect into its curriculum. We have the opportunity to teach values like good sportsmanship, environmental responsibility, and taking care of our property. What has been the best or most inspirational part of volunteering at Sumner? I love the people: the coaches, the volunteers' spirit, and the kids' drive to keep trying and not give up. Gigi, a seven-year-old student at Sumner said it best at the end of class recently: "Everyone tried their best, so everyone is a winner." We’re rewarded this week with a friendly reminder of why we continue to serve, give back, and dedicate our time each Saturday from upstate native and first-year Tompkins volunteer, Bruce Thongsack. Though, from his answers, you’d think he’s been involved with the program for more than a couple of weeks! His enthusiasm and passion out there on the courts is genuinely felt through his voice and, more often than not, accompanied with a smile. We catch up with Bruce about how he was introduced to tennis, why he continues to play, and what lead him to be involved with KCTL today. What (or who) influenced you to pick up tennis? My brother and I grew up obsessed with sports. We watched them all and played what we could. One day, I found myself watching a new game on TV. It was a tennis match between John McEnroe and Ivan Lendl. WHAT. IS. THIS!?!? Who is this intense American guy? Who is this European dude with the poise and precision? (And why do the announcers keep talking about love? GROSS!) I was fascinated. Soon after, I became involved with a community program similar to KCTL and picked up my first racquet. Out of all the volunteering opportunities in New York, why did you choose KCTL? I love tennis and I could never turn down the opportunity to work with the greatest, most endlessly amusing young tennis fanatics in New York. For all intents and purposes, I was one of these children. I was lucky enough to be involved with a program like KCTL and it expanded my worldview far beyond the confines of my small Upstate New York hometown. What made you want to give back to your community? I come from an immigrant family that received kindness from our adopted community, so I feel a strong obligation to pay it forward. My social-justice-tiger parents were leaders in a number of communities--from our Buddhist temple to the greater Laotian diaspora. They did not tolerate ignorance or myopia and instilled in us the belief that if you're not part of the solution, you're part of the problem. If there was only one piece of advice you would like to give the kids, what would it be? I'll out-silly all you honey badgers! Just kidding. Sort of. The real answer is the same thing I repeat a hundred times every Saturday afternoon: Keep working--you've got this, baby! Effort and confidence are transformative; I see it happen every week. Who's your favorite tennis player? Why? Meet Omar Bailey: a new volunteer at Kings County Tennis League's Marcy site. A Brooklynite by way of Florida in his early 30s, Omar is a self-described tennis fanatic who discovered the sport only a few years ago. Having grown up with almost no exposure to tennis, Omar is ecstatic to share his newly found passion with children who--if not for individuals like himself--would otherwise miss out on the game's enormous benefits. What sports did you and your friends/peers play as children? Just basketball, baseball, and football. Not tennis. So, what, if anything, did you know about tennis as a child? I knew of Serena and Venus Williams, but I didn't know much about the game. I only watched from time to time if my father happened to be watching, which was not often. How and when did you discover tennis? Three years ago, my girlfriend, Allison, introduced me to the sport. We went to the US Open together, where I witnessed firsthand how powerful the tennis pros are. I fell in love with the game immediately. How did tennis become a passion following that introduction? Just a few days after the US Open, Allison and I bought tennis racquets to play ourselves and I really enjoyed it. From there, I enrolled in lessons, began watching professional matches religiously (I even subscribed to the Tennis Channel! ), and became obsessed with everything tennis. With lots of practice, I've advanced my NTRP rating to a respectable 3.5. I play in two different local tennis leagues and actually won the final tournament in one of them this past winter. I'm excited about improving my game every time I play. What personal benefits have you experienced as a result of playing the sport? The mental battle of tennis is the aspect that has helped me the most. I'm already a pretty patient guy, but playing tennis--playing for yourself--really makes you focus and think step-by-step about what you want and need to accomplish. The other benefit is the exercise. Tennis is a great, enjoyable way to work out and stay in shape. I would prefer to play tennis for two hours than run on a treadmill any day. How has your experience as a volunteer at Marcy been so far? It's been great! The kids are awesome and I can see that they are enjoying their new surroundings and playing tennis. I was very impressed with one of our recent off-court discussions about anger management. The kids were so open to sharing their feelings and thoughts and articulated themselves so well. That was sort of my "aha moment." It became clear to me what we are trying to accomplish and teach the kids other than just playing tennis. How have the absence of tennis in your childhood and your subsequent discovery of the game influenced your role as a volunteer/mentor at KCTL? I grew up in South Florida amongst tennis courts and the USTA facilities where all the top players would train--but I had no clue that I was within arms reach of the sport. I would not want a child to miss out on tennis if I knew they would enjoy it. The nice thing about tennis is that it does not matter how tall, fast, or strong you are, although those things can be helpful. You just have to show up and be willing to listen, learn, and have fun. After a successful series of training workshops, our volunteers are officially ready to bring tennis to the kids of Bed-Stuy! Comprised of approximately 90 individuals of all ages, backgrounds and professions, our 2015 volunteer base is the largest in KCTL’s history. Director of Programming Meredith Brown led two large group sessions on April 25 and May 2. Both meetings enjoyed high attendance rates, welcomed many new faces, and shined with enthusiasm. The April 25 session was held at Marcy. Given the relatively pleasant weather and the large size of our group, we deviated from our initial plan to meet in a classroom at Marcy Library. Instead, volunteers absorbed the 2015 tennis curriculum in a much roomier setting: a big, seated circle on the Marcy tennis court. Surrounded by several dozen volunteers, Meredith outlined the organization’s history, our goals, typical class structure, and expectations for volunteers. The outdoor space was especially useful for Lafayette Gardens Site Coordinator Candice’s simulation of an off-court activity and discussion. Following the curriculum overview and the mock off-court session, volunteers divided into small groups to practice tennis drills and games. The session commenced with Breakout to familiarize volunteers with our typical end-of-class game. View photos from April 25 training on Facebook. On May 2, volunteer training was held at Asphalt Green Battery Park City, an athletic facility in lower Manhattan. Though a markedly different space than the Marcy court, this training session was equally effective and engaging. Here, volunteers learned about KCTL in a traditional classroom setting complete with a presentation screen to visually reinforce Meredith’s speech. Again, volunteers participated in a demonstration of an off-court discussion—but the relatively smaller space didn’t prevent them from having fun! After a short break, training resumed downstairs on an indoor basketball-court-turned-tennis-court with a portable tennis net. Meredith led a series of drills with the entire group, which included each volunteer's opportunity to practice feeding balls with lots of energy. Again, training wrapped up with a few rounds of Breakout. View photos from May 2 training on Facebook. Volunteer training didn’t end on May 2, though, as was originally planned. Following unexpectedly high volunteer interest, we added a medium-sized group session this past Saturday, May 16. We also have a few smaller meetings planned throughout the final days before the season’s start. Volunteers still interested in participating with KCTL who have not yet registered for a training session can contact Meredith Brown to arrange an individual meeting. Thank you so much to everyone who's come out so far! We couldn't do this without you. Hey, Volunteers, let's get this season started! We've redesigned our tennis curriculum to equip you better than ever before with the resources to engage and inspire our youth athletes. All volunteers--returning and new--are required to attend one training session of their choice in order to qualify to mentor our students this season. Training will be held in Brooklyn on Saturday, April 25 and in Manhattan on Saturday, May 2. Led by Meredith Brown, KCTL Director of Programming, the training sessions are divided into a sit-down presentation and an on-court demonstration. Our training sessions are filling up quickly. Be sure to register ASAP for your preferred date and location. No summer plans yet? We've got you covered. 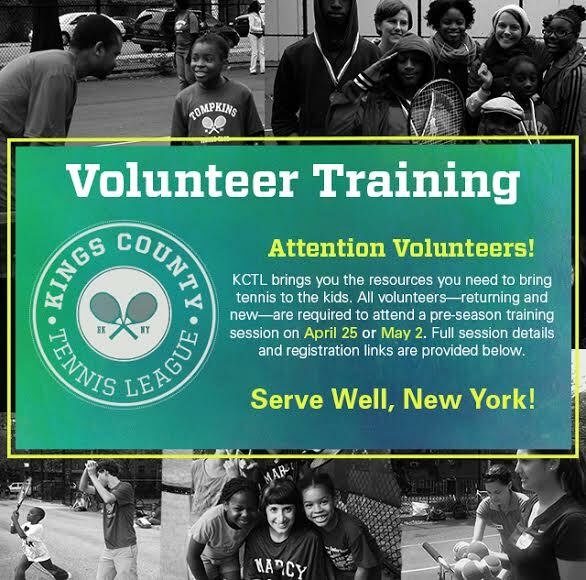 Register to volunteer with Kings County Tennis League. Our season begins May 30. Individuals of all ages (16+) and tennis abilities are welcome. Our volunteer mentors are role models for children ages five to 15 in various public housing communities in Bedford-Stuyvesant, Brooklyn. Guided by KCTL staff, volunteers inspire kids with an enriching curriculum that combines the fundamentals of tennis with personal growth. Volunteers are required to attend a minimum of two classes per month—a total monthly commitment of five hours—for our season that runs through September 26. Classes begin at 12:30 PM and end at 3:00 PM each Saturday. Although we are primarily looking for on-court volunteers to mentor our students, we also welcome any interest to dedicate your Event Planning, Social Media, Administrative, Web Development, Publicity, Photography or Videography skills to KCTL. We have all types of volunteers--high school and college students to retirees; lifelong Brooklyn residents to Southern transplants to a California girl; artists and lawyers, businessmen and sports coaches, tech entrepreneurs and city employees; tennis collegiate athletes to never-held-a-racket-before newbies. It's really great to see so many people come together to spend a few hours doing a good thing--motivating, mentoring and inspiring the kids! This season hasn't even started yet and we're off to a great start! Thank you volunteers, we couldn't do it without you. Volunteer in 2014 with KCTL! There may be inches of snow on the ground, but at KCTL, we're counting down the days until we can hit the tennis court! If you're interested in joining the KCTL volunteer crew, please do! We're always looking for more dedicated and enthusiastic individuals to help us on the court and off. People of all ages, backgrounds and tennis levels are welcome to participate! Sign-up on our Volunteer page. And we'll keep you updated on upcoming volunteer training dates in April (for on-court volunteers). If you want to help behind the scenes, complete the form on the Volunteer page and a KCTL representative will get in touch with you as soon as possible. And if you have up to 15 hours to spare each week, KCTL is also currently hiring a PT Administrative Fellow to help with the program's logistics. You can view more details on our Jobs page. As KCTL enters into its 4th season this year, we've made a pledge to improve our program at all levels. We never ask the students to be perfect, only that they be the best they can be. And now, we're holding ourselves to the same standards. Last week, Jon W., the KCTL Vice-President, led a group of 10 or so, through some basic knowledge and drills specifically targeted for kids 10 and under. We went through the four types of tennis balls and how they're made specifically for certain age groups so that they bounce at waist height and have a certain pace to them. Then we broke up into pairs to work on several drills. The drills for kids under 10 mainly consisted of dribbling the tennis ball between partners in the doubles alley with slight variations: stationary, while movings, with two hands, and with one hand. This advances to dribbling the ball between partners while catching it on the center of their racquet. For the youth athletes, the goal of these drills are two-fold: to work on basic hand-eye coordination as well as timing. For the volunteers, we focused on how the kids bodies should be positioned, how their feet should be moving, and how to turn it into a game rather than a drill where students can count the number of successful passes in a minute. The winning student(s) can help lead the next drill. Then we worked on the basic components of the serve. For the drill, we all stood in a line with a good amount of distance between, and then we tossed the ball up with one hand and made the serve motion with our other hand to catch the ball. After we could all do that numerous times in a row, we moved to using the racquet and catching the ball with our hand and racquet at the point highest above our heads where we would want to make contact for a serve. The serve drill helps new and young tennis players get a feel for what is a good throw as well as the swinging arm motion for a serve. It focuses them to understand and improve upon the fundamentals of the serve, without getting distracted by things like speed, strength and "getting it over the net." After the drills, Jon walked us through two of the most popular games played at the sites 3 Strikes and Jail Break. In 3 Strikes, a volunteer feeds the students balls and sets up an "in-area" where the student has to hit the ball to. It can be as simple as returning the shot within the singles lines to as specific as returning a down-the-alley forehand past the service box. If the student misses the shot that's a strike and they return to the end of the line. (If the student makes the shot, they return to the end of the line.) Once a student has three strikes, they're out. The same premise applies for Jail Break, only if the student doesn't return the shot correctly, they move to the other side of the court where the volunteer is feeding balls, that side of the court is "jail." If a jailed player catches a ball of another player, they get to free themselves and get back in line, while the other player has to enter jail. It's similar to dodge ball rules in that way. Both games end when only one player is left. Join us tomorrow, for Part II where we'll be focusing on drills and games for the older kids. Training is held from 12:30 - 3pm at the tennis court in Marcy Playground in Bed-Stuy (the corner of Myrtle Ave and Nostrand Ave.) Please be on-time as that's another life lesson that we'll be stressing with the kids this season. Lunch will be provided. View all the photos from Volunteer Training Part I on the KCTL Facebook page.